On a recent Geocaching outing I got to walk a bit around what is left of the old Humewood narrow gauge station. Of the actual station and sheds nothing really remains, but there are still a couple of carriages on the line between where the station used to be and Kings Beach. Makes for interesting photography. 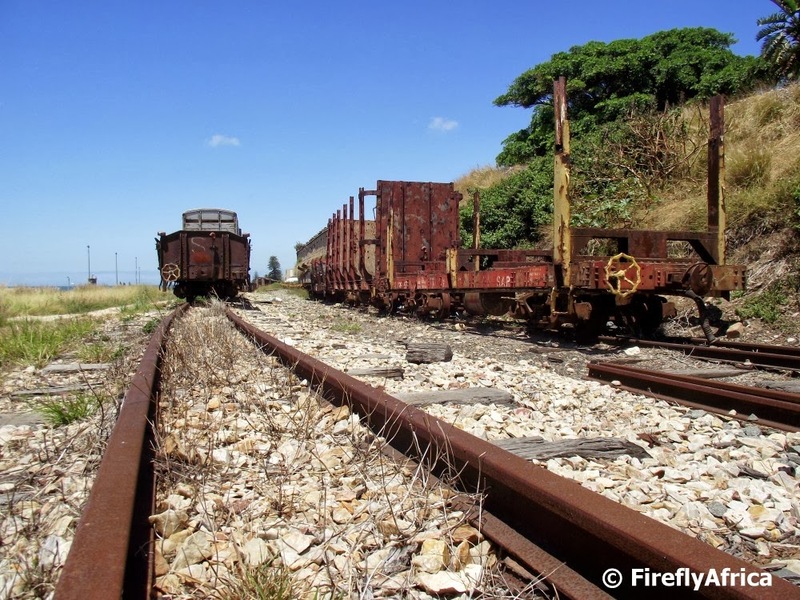 In the mid 1800's there was a boom happening in Port Elizabeth. It was during this time that Sir George Grey, Governor of the Cape from 1854-61, played a leading role in the establishment of educational institutes throughout the colony. 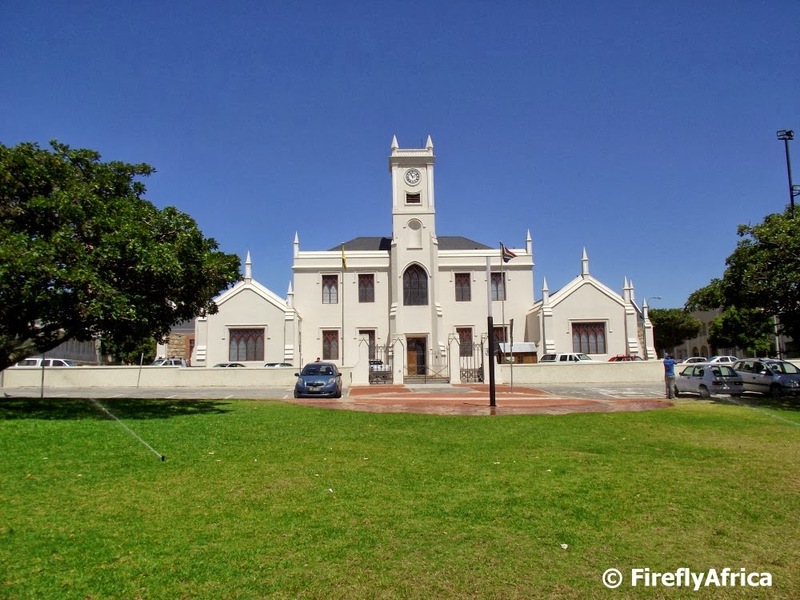 At the instigation of John Paterson, one of Port Elizabeth's the first Town Councillors, the then municipality took over vacant land on top of the hill opposite the Donkin Reserve and the establishment of a grammar school. A Mr Archibald was commissioned to prepare plans and specifications for the building in September 1856 and by the end of 1858 the school was ready for occupation. The town decided to name the school in honor of the Governor, in recognition of his contribution to education in the colony. In January 1859 elementary classes were commenced and in April the high school was formally opened. When the building was built it didn't have a clock tower (as can be seen in the Then photo above). This was added in 1875 gave the building its dominant character over its surroundings. By 1914 the building had grown too small for its needs, and the high school was moved to its current location in Mill Park. 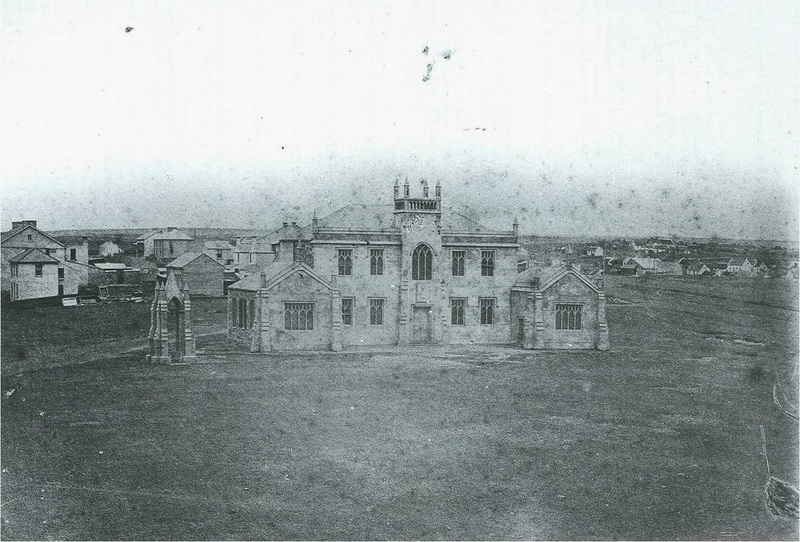 After that the building was used by Pearson High School (now in Summerstrand) and Albert Jackson Primary School (which later moved and became Greenwood Primary on Park Drive). The building was declared a National Monument on 10 December 1976. The Grey Institute building started to fall into disrepair and wasn't looking very good when it was bought by the Mediterranean Shipping Company for their Port Elizabeth office. Over the last decade or so they have pushed millions of rand into the restoration of the buildings with a full time restoration team and the place is looking stunning inside and out. Well worth a visit if you can twist somebody's arm to show you around. Everybody who visits the Donkin Reserve is in awe of the huge 470 m2 mosaic next to the pyramid. Very few actually notice the frame of mosaic blocks surrounding the base of the lighthouse. 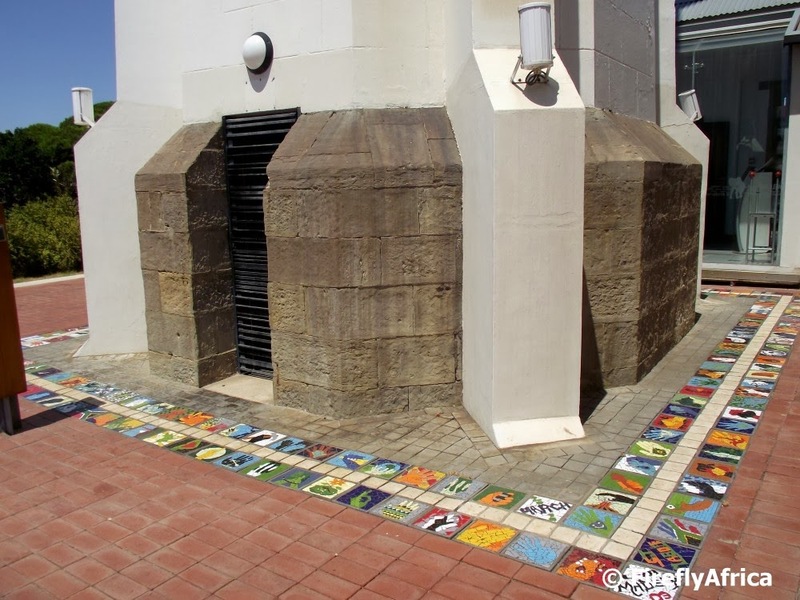 The mosaic blocks is a celebration of symbols and icons within Port Elizabeth and its surrounds referencing various stories, personal ideas and journeys. One actually have to spend some time and look at each one individually to really see what they are about and to appreciate the art as a whole more. 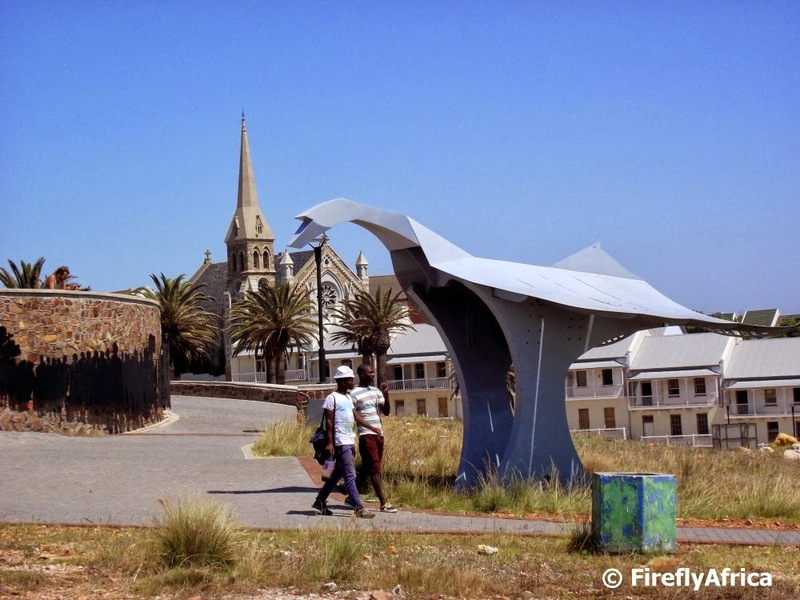 Visitors to the Donkin Reserve may think the aliens have landed when they walk past the Fish-Bird art piece on the Donkin Reserve. The Fish-Bird is one of the art pieces forming part of Route 67 and was done by artist Mxolisi Dolla Sapeta. The sculpture represent the fish found in Algoa Bay which is visible from Donkin and the birds found on the Reserve itself. The Fish-Bird has "landed" here to take ownership of this transforming site, making itself at home amongst the history and art found here. 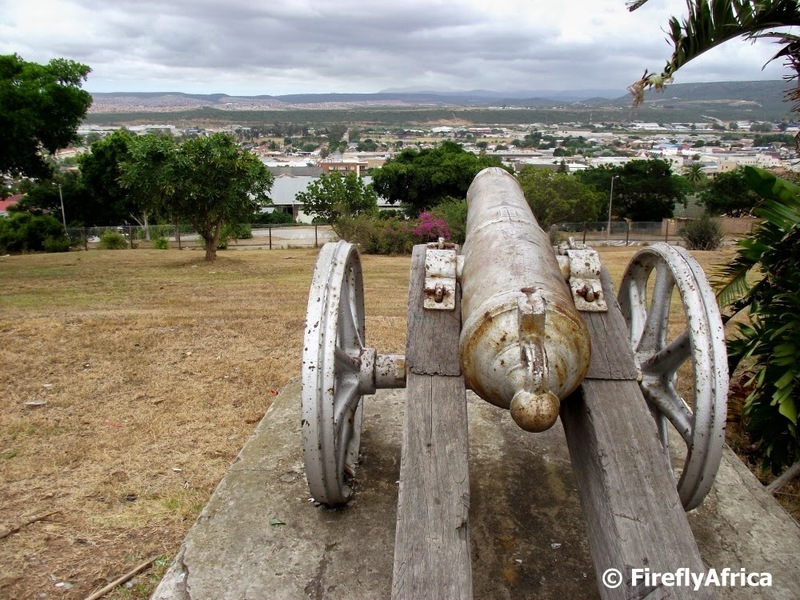 The best view point in Uitenhage is probably Cannon Hill with view both to the south and east. The park on Cannon Hill has to coronation memorials, one for Queen Elizabeth II and one for King George V. There is also a cannon on the hill pointing south and this along with the name makes me think that the hill was used as a lookout and potential defense point for the town at some stage in its history. 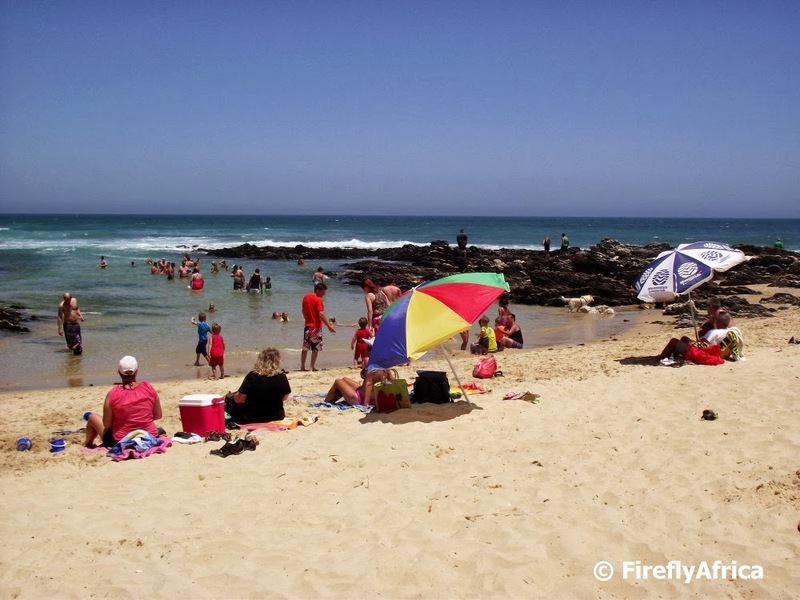 The Super Tube at Kings Beach has become one of the Port Elizabeth beachfront landmarks a long time ago and is still as popular as possible. Drama Princess turned nine last week and yesterday (Saturday) we had her birthday party at the Super Tube. It's even more fun as I remember and things have changed a little bit with extra slides being added since I was a kid. When I say kid I mean kid in age cause yesterday I was a kid in spirit, outsliding and outlasting Drama Princess and all her friends. I say outside cause I went just about non-stop from just after 10am until 15:30. Needless to say my tank was empty by the end of the day and I'm feeling it today but I'll be back as soon as I get a chance again. 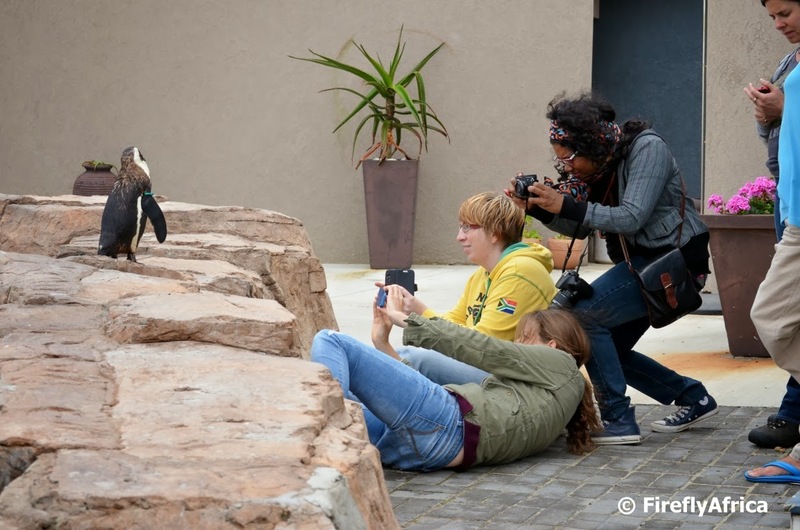 One of the things I loved the most about the #PERocks bloggers visit to Port Elizabeth was the fact that the bloggers always had their cameras close by and took photo of everything and from every angle. 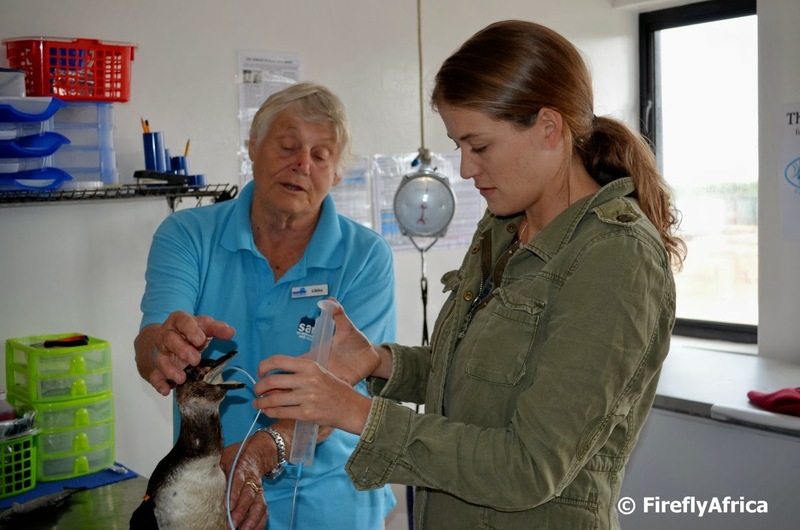 Like here at the South African Marine Rehabilitation and Education Centre (SAMREC) in Cape Recife. Penguin photography at its best. 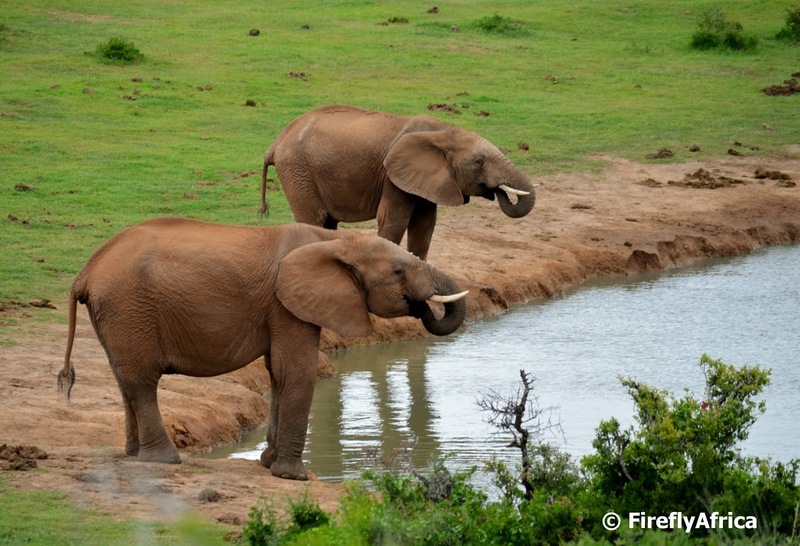 A couple of young elephant bulls drinking at Gwarrie Dam in the Addo Elephant National Park. Gwarrie is one of the waterholes where you often get to see elephants but unfortunately also one of those spots where a lot of idiots get out there cars for a better look. Luckily I didn't encounter any clowns on this visit, just these two dudes. 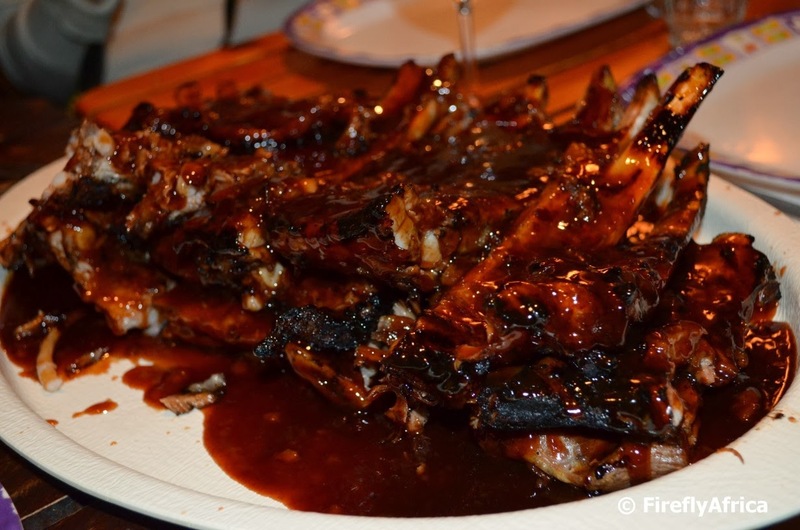 There are a couple of restaurants around town that serve really good ribs. The one at the top of my list at the moment is Cubata in Sydenham close to the Nelson Mandela Bay Stadium. 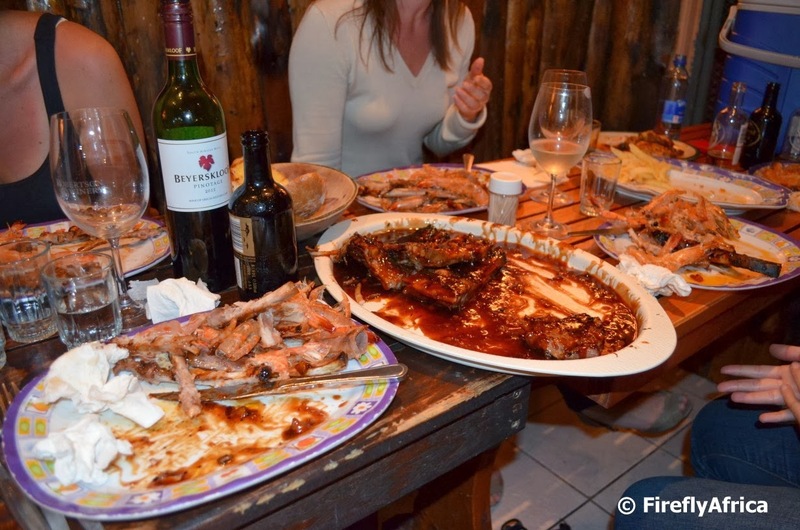 It was one of the dinner stops on the #PERocks bloggers trip and I got the opportunity to try out more than just an order of ribs. 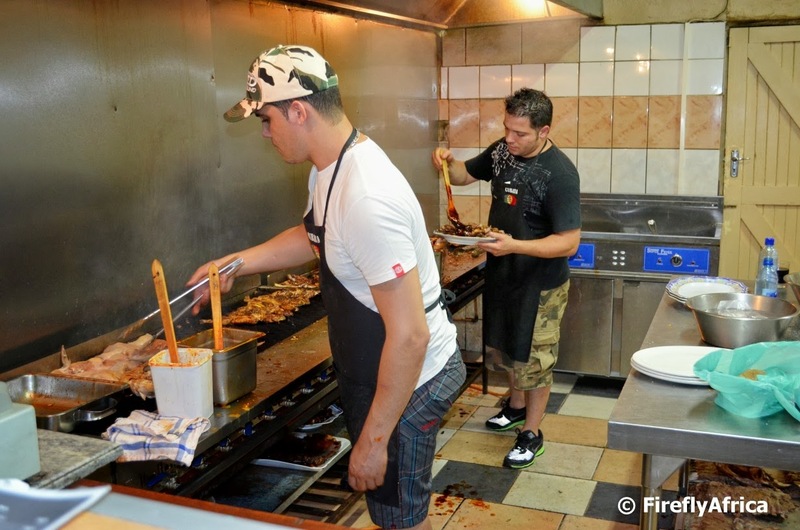 The kitchen is manned by the owner's two sons and these two guys churn out some really tasty food. 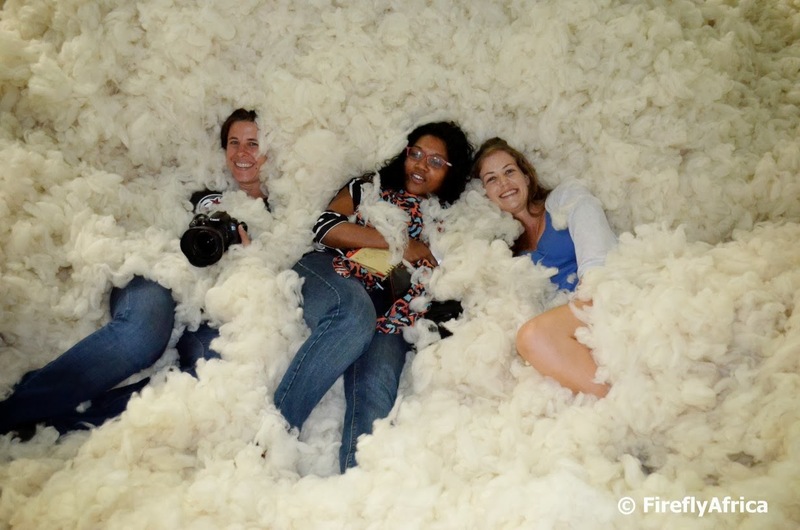 Three of the #PERocks bloggers, Heather Mason of 2Summers, Meruschka Govender of Mzansi Girl and Rachel Lang of Bushbound Girl, having that sinking feeling in the sheep wool on the Hinterveld Mohair Mill Tour. Not something one can do just anywhere. In November I hosted the #PERocks blogger visit to Port Elizabeth when I was still with Nelson Mandela Bay Tourism and I had the most amazing time with bloggers Rachel Lang (Bushbound Girl), Heather Mason (2Summers), Dianne Tipping-Woods (SA Tourism blog and more), Theresa Lozier (Fine Places) and Meruschka Govender (Mzansi Girl). I just couldn't get enough how how they did things differently from regular media. A lot more informal, a lot more fun and a lot more insightful. 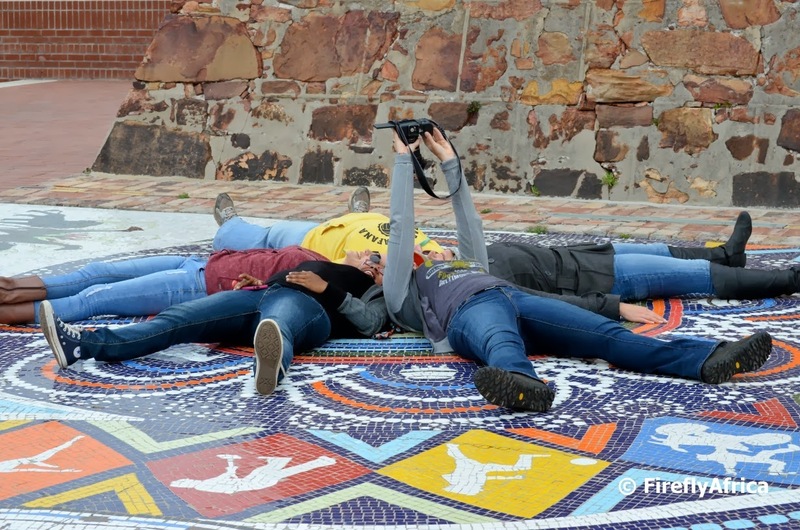 Here Heather was taking a selfie of the five of them lying down on the mosaic on the Donkin Reserve. One more photo of the Pasella shoot in Port Elizabeth for the insert about Geocaching. 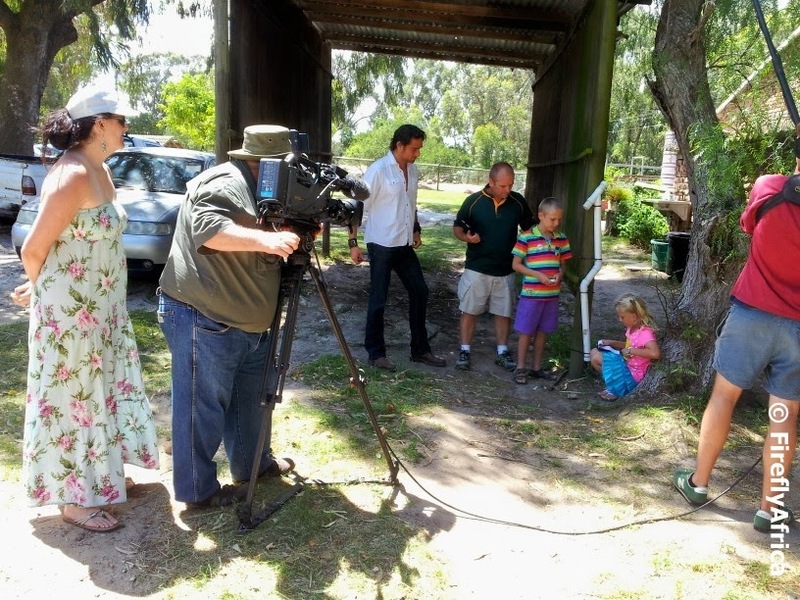 Here the presenter and I meet up with the KidZ at the East Cape Horse Care Unit for the second cache of the day. This was my third shoot in front of the cameras with Pasella and every time I have thoroughly enjoyed it. Unlike what some people may think, it isn't a quick process though. The insert was probably only about 5 minutes in length but the shoot started at 9:30 am and only ended at about 6:00 pm that afternoon. The Damselfly compared it to watching paint dry. I loved every moment of it. Dodds Farm is part of the Baakens Valley and can be reached from the bottom of 9th Avenue in Walmer. It's a beautiful spot that could perhaps do with a bit of maintenance, bush clearing and grass cutting, but ideal for a picnic and some quiet time. 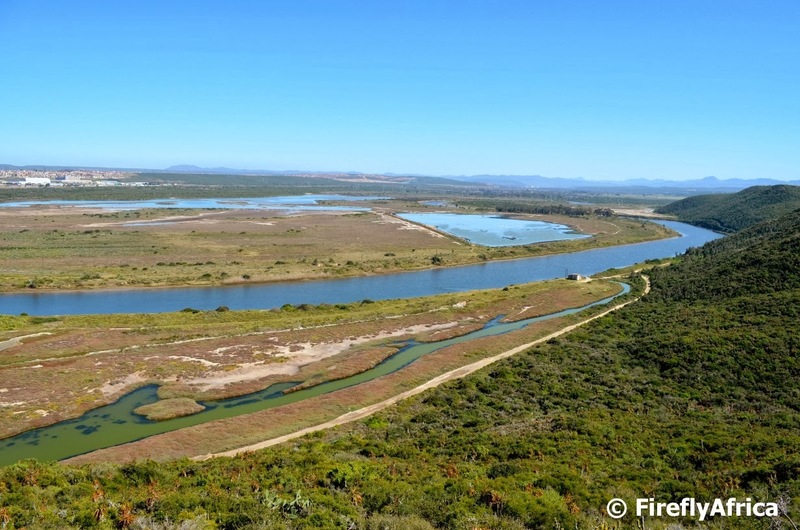 The Baakens River flows right through Dodds Farm and there are several trails in the area, amongst them the Guinea Fowl trail and some trail running and mountain biking tracks. Late last year we spent an evening at Willows Resort with the in-laws and this was the sunset from in front of chalet. You couldn't ask for better. Over the last year I have become absolutely addicted to Geocaching. Maybe that's an understatement. I was addicted from day 1. 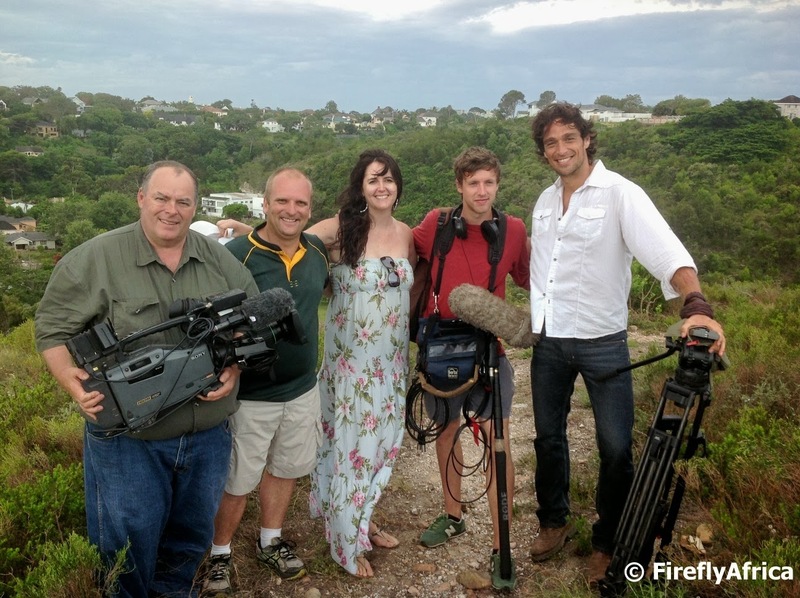 In December the crew from Pasella, an Afrikaans magazine program on SABC 2, was in town to shoot an insert about Geocaching in Port Elizabeth for the show. Their "guide" during this adventure.... yours truly. I even got the KidZ to briefly appear in the insert. I did three caches around PE with them, at St Georges park, the East Cape Horse Care Unit and Wellington Park above Settlers Park in Walmer. The insert presented by Paul Rothmann (on the right in the picture) also features Wicus and Ansie Benade of Team Wikkelgat. If you are based in South Africa, don't miss the insert tonight 12 February 2014 on SABC 2 some time between 19:30 and 20:30. Here I am with the crew in Wellington Park. It's competition time!!!!! Port Elizabeth Daily Photo and The Grand White Team is giving away two basic tickets to the first Grand White Dinner to be hosted in Port Elizabeth. The Grand White Dinner Port Elizabeth takes place on Saturday 8 March 2014 at ........ Nope, I'm not allowed to tell you where because it is a secret until only a couple of hours before it starts. The Grand White is an elegant picnic event setting the standard for extravagant outdoor events at a venue somewhere in the Friendly City. The idea behind the event is to spend an extraordinary night together with friends and family enjoying great food and being entertained by live bands, magicians and acrobatics while celebrating life. For this first edition the guest list will be limited to no more than 2000 guests. All guests need to be dressed in white with a touch of green. You can either bring all your own food/table/chairs or you can rent a table and chairs along with a picnic basket when ordering tickets. Tickets can be bought from https://grandwhitedinner.nutickets.co.za/ while more information can be obtained from www.TheGRANDWhite.com and the Grand White Dinner PE Facebook page. Entry to the competitions is restricted to one entry per person, multiple entries will be disqualified. The competition is open to anybody who is able to attend the event in Port Elizabeth on 8 March 2014. The winner will be chosen at random from all valid entries. The judge’s decision is final and no correspondence will be entered into. The closing date for the competition is Wednesday 26 February 2014. To enter you need to answer the question in this post's comment section (and not on Facebook). QUESTION: If you had to add one green item to your white outfit for the Grand White Dinner, what would it be? The gully on the beach at Kini Bay is fast becoming a favorite with my family. It's safe, not too crowded and a great spot to teach the kids how to snorkel. 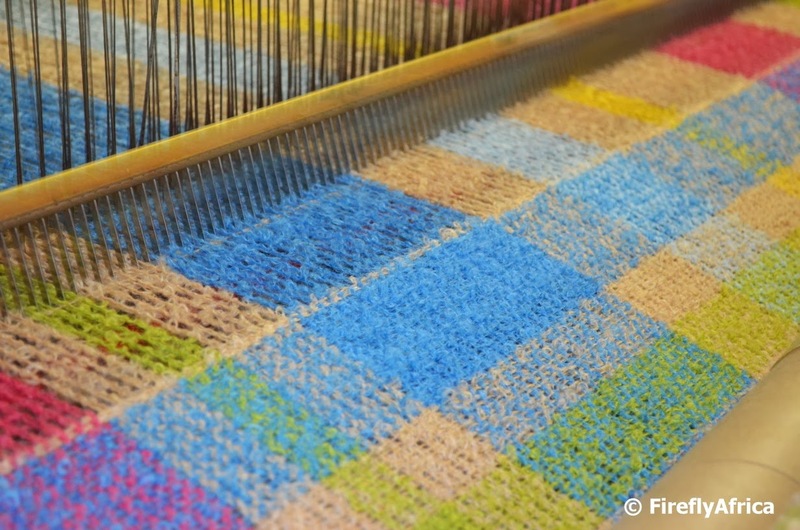 The Hinterveld mohair weaving mill in Uitenhage produces mohair blankets and other products for retail all over the world. Who would ever have thought that Uitenhage would play on major fashion platforms but when you see the products produced there you would not be surprised. 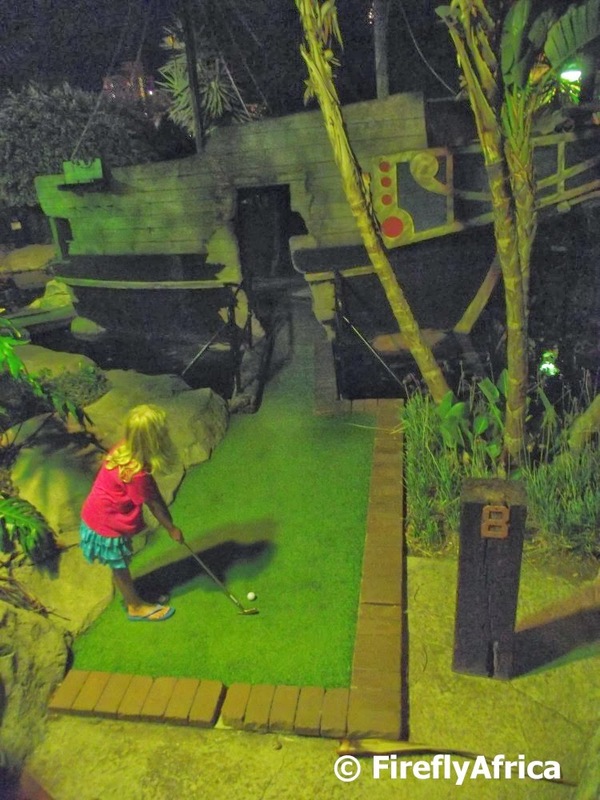 I haven't played putt-putt in ages and the other night got pulled into a family putt-putt tournament with Damselfly, Chaos Boy, Drama Princess and my mom at the Boardwalk. I'm proud to say that I haven't lost the touch and walked away with the honours. 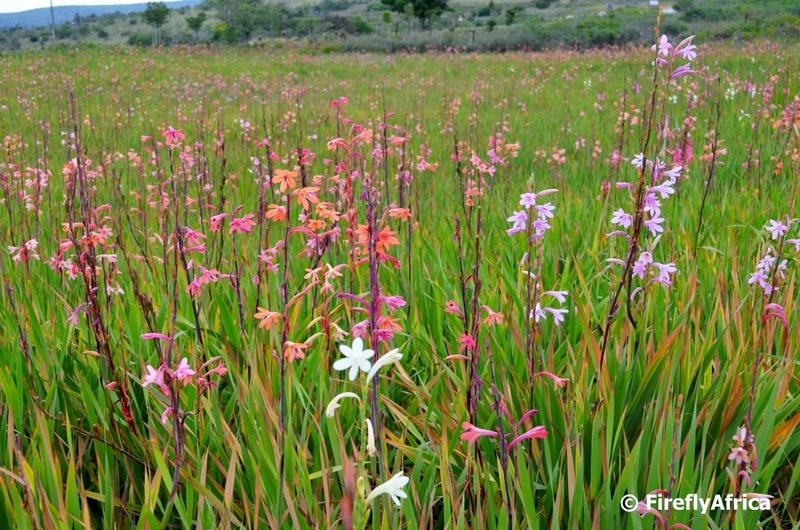 The Swartkops River and surrounding estuary is a wonderful place, even with it's pollution problems. It's an amazing birding wetland and a major salt producing area. Looking at the picture the actual river is in the background on the left while the big channel through the middle of the picture is part of the salt pan system used by salt producers. 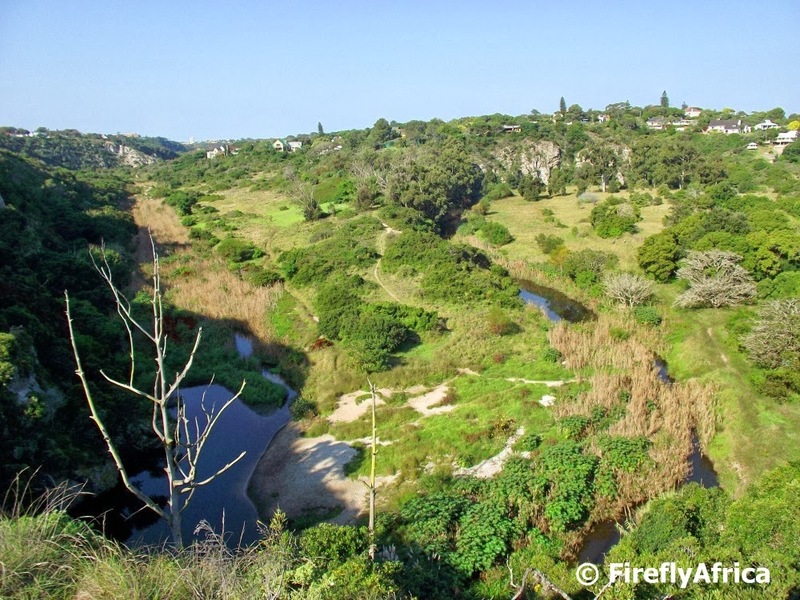 The vegetated area to the right of the river is part of the Zwartkops Nature Reserve. 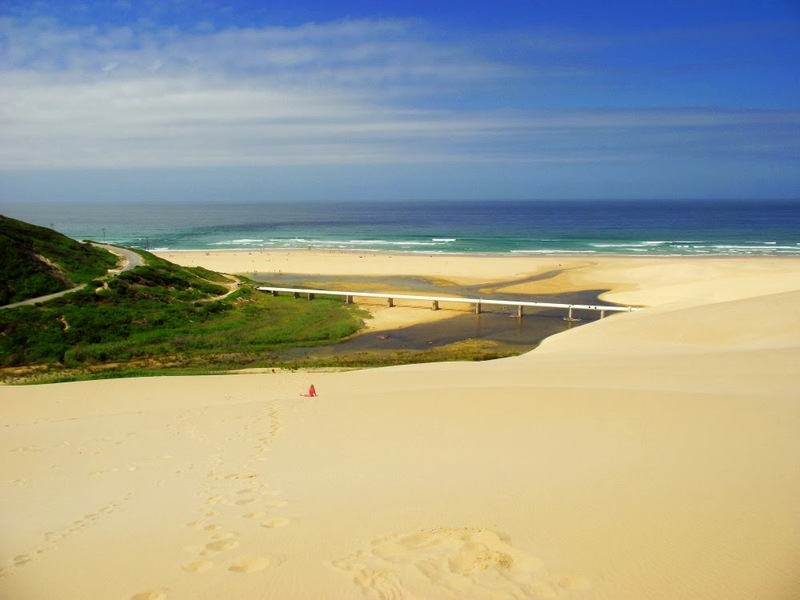 I often wonder how many Port Elizabeth folk have never climbed up the Maitland dune at least once in their life. Can't be many but if you haven't, this is the view you would not have seen. In between Seaview and Maitland is an area called Beachview. 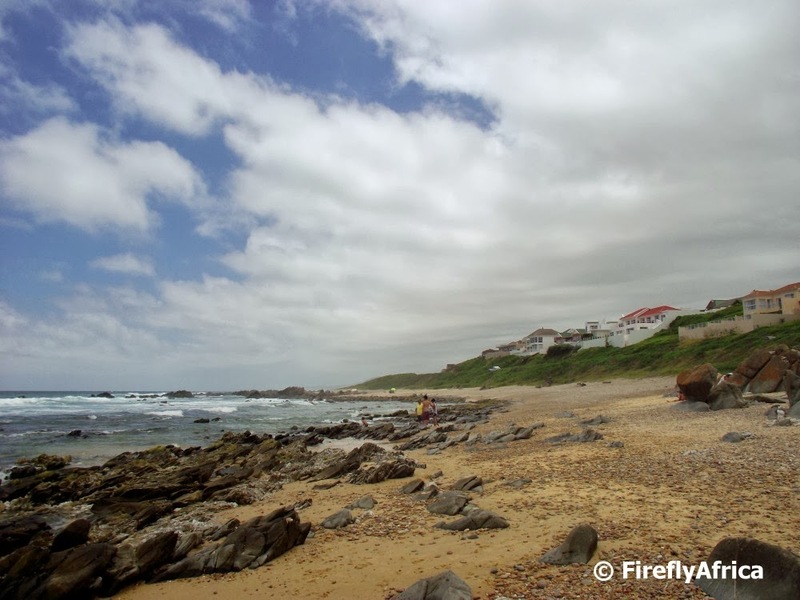 Like Seaview it's technically a suburb of Port Elizabeth and made up of a collection of houses close to the coastline. I often think that the person who came up with the name (and that of Seaview) really wasn't having a very inspirational day when they did. 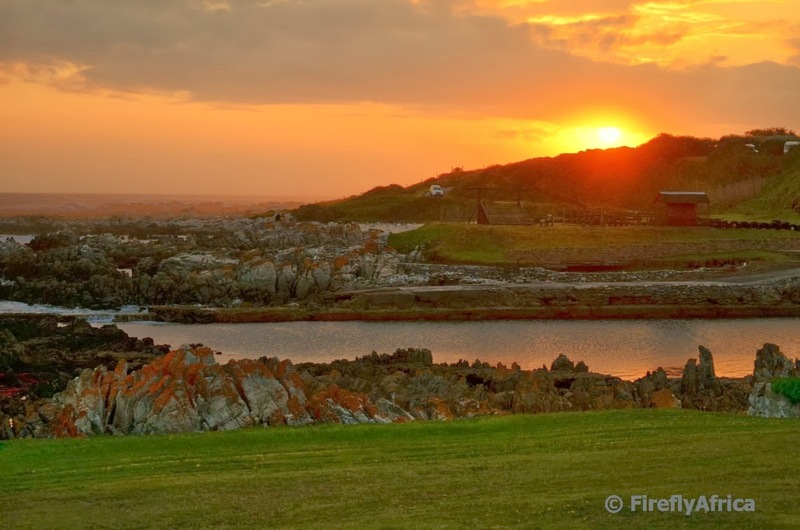 The Seaview / Beachview coastline is a rugged one but the advantage of that is all the coves and gullies which is safe for families to enjoy at low tide. By the time I took the picture the tide had come in and we were ready to leave. 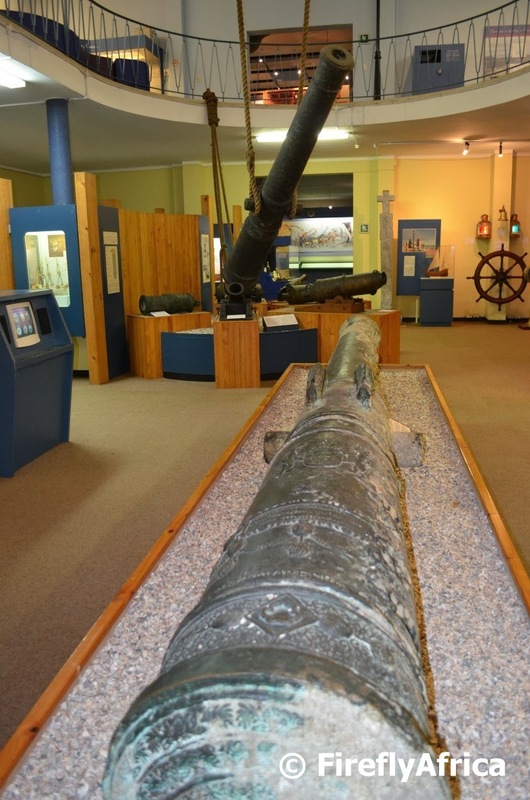 The Shipwreck Hall in the Port Elizabeth Museum at Bayworld has some excellent information on shipwrecks around Port Elizabeth. The displays contain a lot of artifacts salvaged from wrecks like the Sacramento, Amsterdam and Doddington. One of the items that form the centerpiece display is a cannon salvaged from the wreck site of the Portuguese galleon Sacramento near Schoenmakerskop in the 1970's. The Sacramento ran aground in a storm on this coastline in 1647 with 72 survivors making it to land before staring their 1400km walk to present day Maputo. 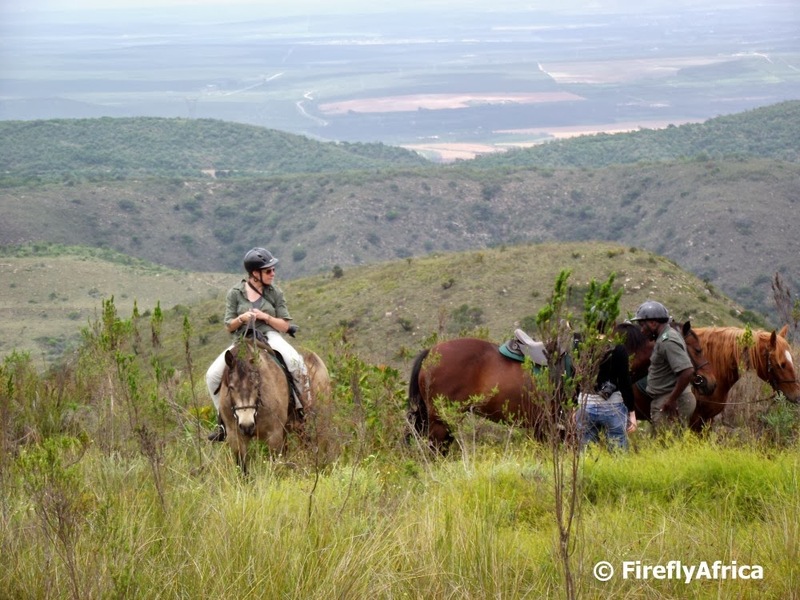 Addo Elephant National Park offers horse riding in two locations within the Greater Addo park. 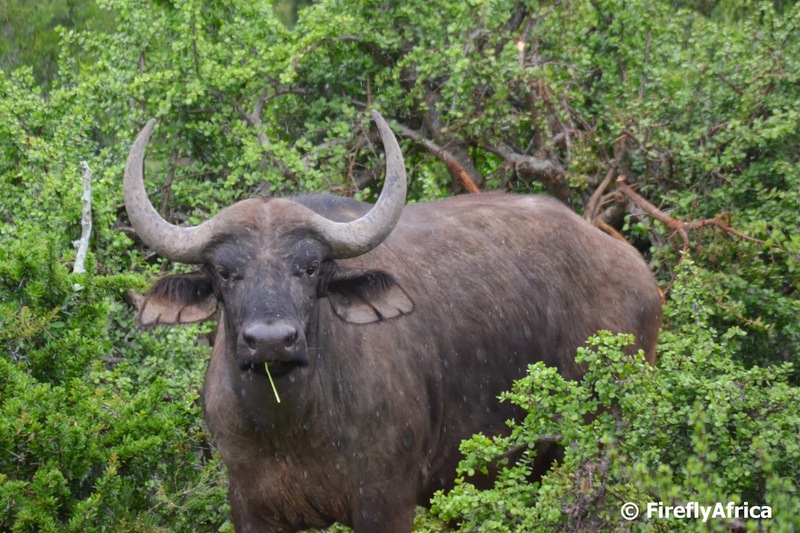 The first is down by the Main Rest Camp where the ride takes place either within the game viewing area or outside the fence if there are predators close by while the second is up on the Zuurberg Mountains. The drive up the Zuurberg Pass is an experience on it's own with beautiful views and a visible change in vegetation as you get higher. Once you arrive at the SANParks office you sign in and receive a safety briefing. On the ride the horses follow the guide along a path over rolling hills with stunning vistas all around. At one stage we got to a spot where you could see just about all the way to Port Elizabeth. Even though you will see less game than down in the game viewing area we still spotted a number of antelope species, but the views make up for it. Have I mentioned the beautiful views? 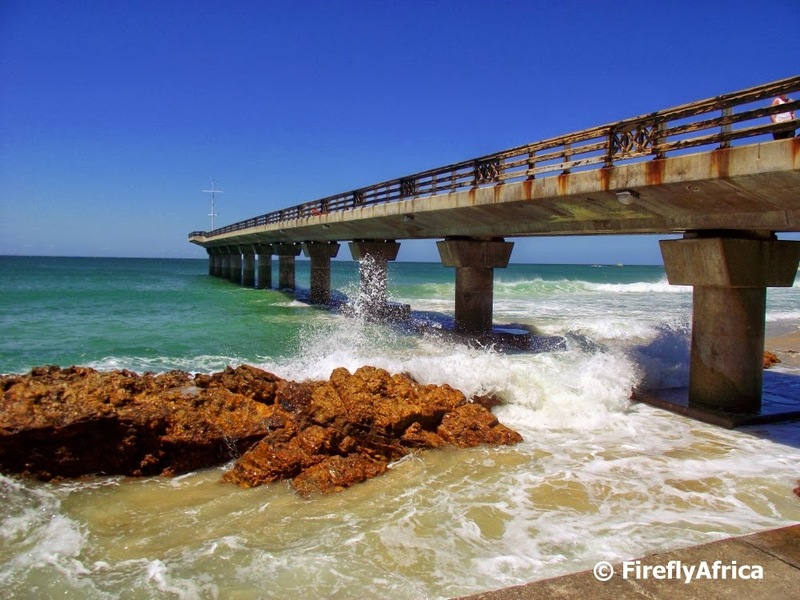 Since being constructed in the late 1990's, Shark Rock Pier has become one of Port Elizabeth's best known landmarks. 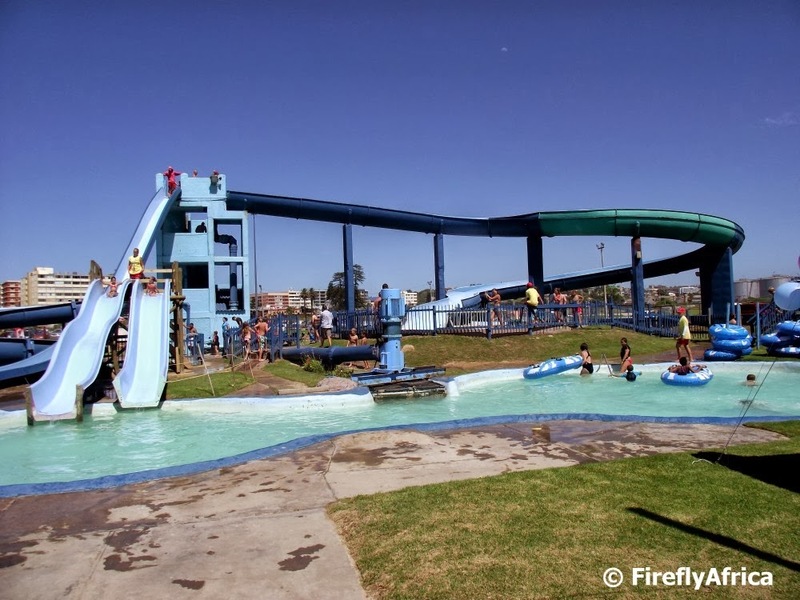 With Hobie Beach next to it and the Boardwalk complex across the road, most visitors to Port Elizabeth inevitably end up going for a walk on the pier enjoying the views of Algoa Bay and the surrounding beachfront. 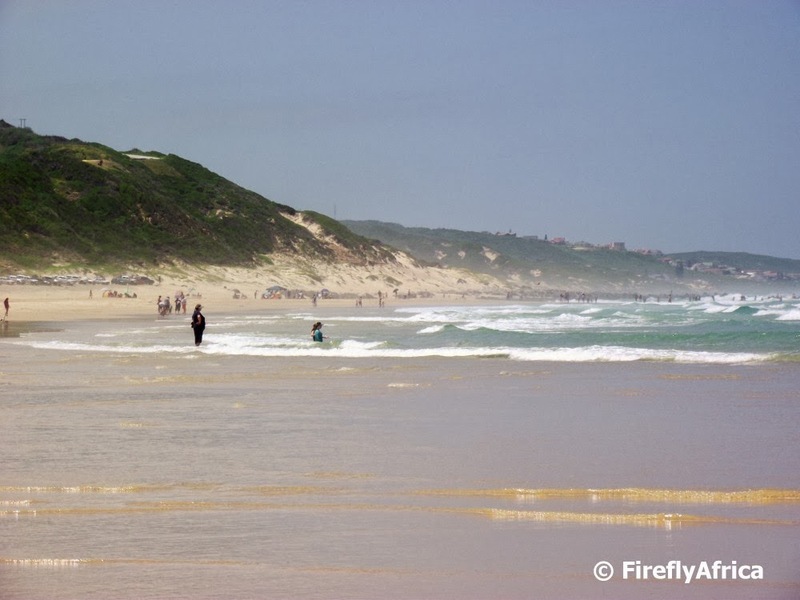 Maitland Beach to the west of Port Elizabeth. Miles and miles of sandy beach, giant dunes and beautiful sunsets. What more do you want?